The U.S. Coast Guard’s new icebreakers will have space, displacement and electric power for weapons when they enter service starting around 2023, Coast Guard commandant Paul Zukunft said. The coastal law-enforcement agency hasn’t decided yet whether to actually add the weapons. Zukunft said that depends on whether the United States, Russia and other countries continue to cooperate in the Arctic and Antarctic regions — or clash over polar shipping lanes, fisheries and mineral resources. Zukunft’s announcement confirmed long-running rumors that the Coast Guard’s new icebreakers could eventually be armed with surface-to-surface missiles or other heavy munitions. The Coast Guard is building up to six new icebreakers to replace the 42-year-old Polar Star, which at 14,000 tons displacement is the only heavy icebreaker currently in U.S. government service. Capable of cracking ice up to 21 feet thick, Polar Star is the only U.S. vessel capable of carving a path to America’s Antarctic research station. 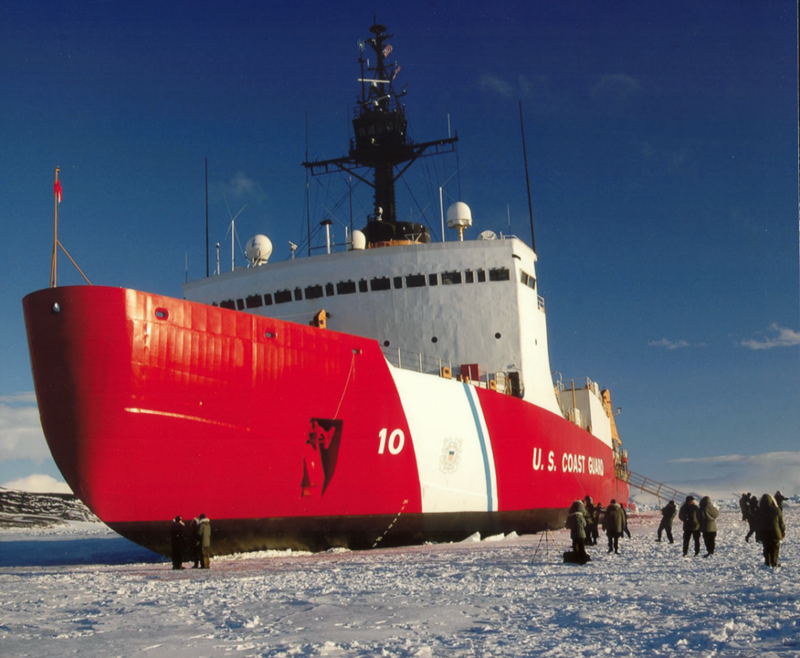 The Coast Guard also operates one medium icebreaker, the 11,000-ton Healy. Commissioned in 1999, Healy can crack ice up to 10 feet thick. The two icebreakers may carry small arms and support Coast Guard helicopters, but are otherwise weaponless. If the new icebreakers do eventually get cruises missiles, they would likely be the most heavily-armed ships in the Coast Guard fleet. In 1990, the Coast Guard test-fired a single Harpoon anti-ship missile from the Hamilton-class heavy patrol cutter Mellon. The heaviest weapons currently in the Coast Guard’s inventory are the 75- and 57-millimeter cannons on the Hamiltons and Legend-class cutters. The Coast Guard is building nine of the 4,500-ton-displacement Legends to replace the dozen, 3,300-ton Hamiltons. Zukunft didn’t say which weapons the Coast Guard has in mind for the new icebreakers, the first of which could end up costing $1 billion. The U.S. Navy is paying for the first new icebreaker. The Department of Homeland Security, the Coast Guard’s parent agency, will likely cover the cost of subsequent icebreakers. The Navy’s own warships are compatible with a range of anti-ship missiles, including the latest versions of the Harpoon, an anti-ship variant of the Tomahawk cruise missile and the new, stealthy Long-Range Anti-Ship Missile. Zukunft said the Coast Guard would add canister launchers to the icebreakers’ decks, rather than install below-deck vertical-launch cells as are standard on most Navy surface warships. Any missile system the coastal agency adds to the new icebreakers will have to be modular, requiring only minimal modification to the host vessels, Zukunft said. It’s unclear what sensors the new icebreakers will carry. In the absence of long-range surface-search radars, the polar vessels might rely on aircraft, satellites or other ships to provide targeting data for their missiles. Russia and Canada are also building armed icebreakers. Zukunft said he’s encouraging America’s allies and rivals alike to keep large naval vessels out of the Arctic and Antarctic regions. Instead, Zukunft said, only modestly-armed coast guard ships should patrol the poles.